Are you ready? Our falcon eggs are almost a month old! And falcon eggs usually hatch a month or so after they’re laid. We are getting egg-actly what we’d hoped for – eggs! 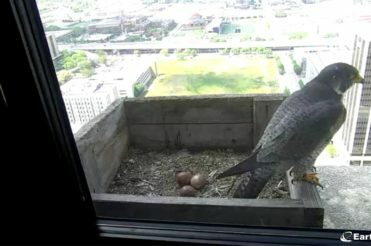 Chayton, the new female falcon at WoodmenLife Tower in Omaha, laid two eggs over the weekend in the uncovered box on the north side of the 28th floor. We finally know who Mintaka’s been so sweet on for more than a month. Please welcome Chayton to WoodmenLife Tower. 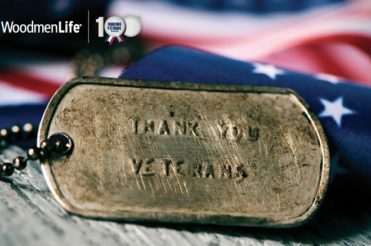 For veteran Susan Rudnicki, the technical skills she learned in the United States Marine Corps from 1980–1982 have long been outdated. But the other skills learned in the military have influenced who she is. 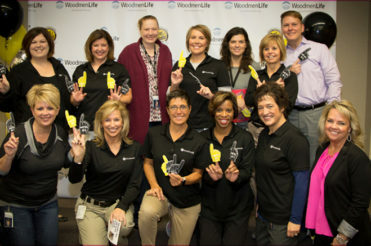 WoodmenLife is joining an elite group of life/health insurance companies in its hometown. The organization has been designated as among the Best of Omaha. 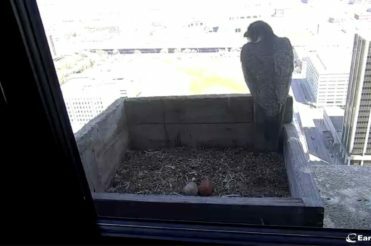 It has been an exciting spring for the Woodmen Tower Falcons and there hasn't even been a egg laid yet. 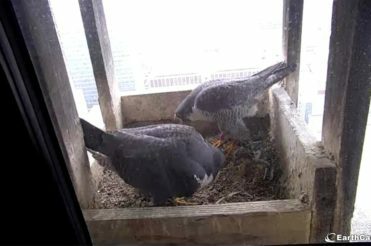 While we wait for Zeus and Hera to begin nesting, here are a few more peregrine falcon facts to think about.